perpetual students, or we risk becoming obsolete." * Do you need to eliminate non-value added costs? * Does your team want to eliminate EOM scrambling? * Does your MRP systems results need improvement? * Do you want to gain control of your day-to-day activities? * Does you want to create a fun work place? * Do you want to increase your contribution and value? If you answered YES to any of these questions, you no doubt will find value for whatever time you spend reviewing the content of this Web page. If you are in search of a better way to advance your career, you have come to the right place. 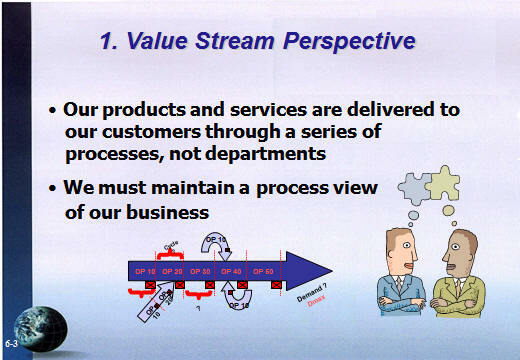 Here you will find Bill Gaw's Value Stream Mapping PowerPoint Presentation (Team Training Module). Training to eliminate non-value activities and related costs... Training that creates bullet proof solutions that return sanity to the workday and raises the level of your contribution and value. "Bill has helped me a lot, either by providing clear and precise directions whenever I asked, or by sharing much of his deep knowledge in his Website, bbasicsllc.com. Managing, with excellence, the combination of sound theoretical knowledge with successful "hands-on" expert-ise, Bill is certainly one of the few persons I'd classify as "Coach of the Coaches"! for anyone... everyone... anywhere... anytime. * Reduce stress in the work place. Most training materials today are PowerPoint� presentations; a simple slide show. Bill Gaw's Value Stream Mapping Team Training Module on the other hand includes 51-powerful, PowerPoint� graphics, "plus" annotated note pages with explanations, and "lessons learned" by a "been there, done that" professional. A value added, learning experience on "how to" design, implement and deploy value stream mapping for personal and company success. And all delivered via the Internet to you within 24 hours of your ordering. � The flow of information, from the receipt of a sales order or production data all the way through the engineering, production control, production, purchasing, shipping and accounting processes. � Production activities, which are the physical tasks employees must perform to produce a product or deliver a service. � Material flow, the physical movement of materials from receiving, through production, to the shipment or delivery of finished goods or services. � Customer value, which is an aspect of a product or service for which a customer is willing to pay. � Cycle time, which is the time it takes to complete an activity from start to finish. � Any waste, involved in your business or manufacturing processes. "Your Team Training Modules are the easiest and fastest way to understand the practicalities of business processes that I have seen in many years of management consulting activity. I intend to use them in my practice, if you are agreeable, since I am now extending into new consulting areas." We are so sure that your Value Stream Mapping PowerPoint Presentation (Team Training Module) will have the impact you desire that you can order entirely at our risk. This Team Training Module comes with a No Risk, 100% Unconditional Money-Back Guarantee. This is a Lifetime 100% Money- Back Guarantee! Believe this, we will never consider your purchase binding until you have reviewed all the material and put it into practice. We know that you, like our other customers, will be thrilled with the results. In fact, we are so convinced that this Value Stream Mapping, PowerPoint-Plus, Team Training Module will work for you that if you aren't completely satisfied for any reason at any time, we'll immediately refund your purchase price. You simply can't lose. the responsibility for self-improvement is yours." "Train the Trainer" Manual - Should you decide to use your training tutorial for in-house training we'll include a download copy of an effective training methodology, a vital "train the trainer" resource. APICS Library nor the HBS Press.